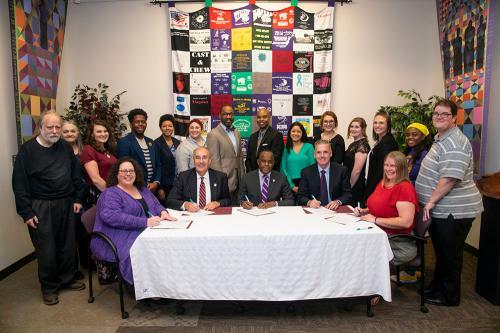 This week, the annual signing of the Take Back the Night Proclamation declared Oct. 25 as Take Back the Night Day. 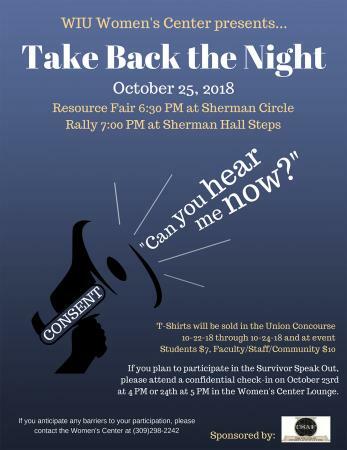 MACOMB, IL -- The 29th annual Take Back the Night event at Western Illinois University will begin at 6:30 p.m. Thursday, Oct. 25, beginning on the Sherman Hall Circle. The event is a march and rally to increase awareness of and to seek an end to sexual assault, dating and domestic violence, stalking and other forms of sexual and power-based interpersonal violence, as well as to remember and honor victims and survivors. The theme this year is "Consent: Can You Hear Me Now?." The program begins with a resource fair at 6:30 p.m. and performances beginning at 7 p.m., before a march to Chandler Park for a survivor speak-out. Anyone interested in sharing their story during the survivor speak-out is encouraged to meet with a counselor from the University Counseling Center for an informal check-in from 4-5 p.m. Tuesday, Oct. 23, or from 5-6 p.m. Wednesday, Oct. 24 in the Women's Center lounge, on the first floor of the WIU Multicultural Center. 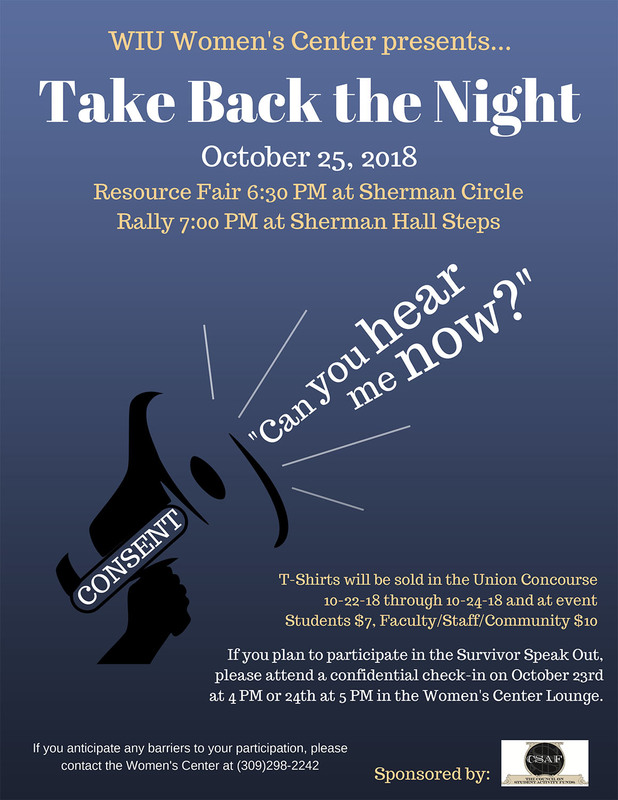 Anyone who would like to participate in Take Back the Night, but is unable to walk the route, may contact the Women's Center prior to the march to sign up to ride in a van that will be provided. WIRC-CAA Victim Services and University Counseling Center staff will be present to talk with participants, if needed. T-shirts, glow sticks and raffle tickets will be sold at the event to raise money for Victim Services. Additionally, the Women's Center is partnering with Buffalo Wild Wings for a fundraiser from 4-8 p.m. Monday, Oct. 22. For diners who bring a copy of the approved voucher, 15 percent of their dine-in or take-out order will be donated to Take Back the Night. For more information about the event, call the WIU Women's center at (309) 298-2242.